During a lecture at the Student Activity Center on Wednesday, Flores-González, an associate professor of Latin American and Latino studies, said she drew her conclusions from a study she conducted on the protestors involved in the surge of marches across Chicago in 2006 for immigration reform. She interviewed 113 Latino millennials — people born between 1980 and 1995 — and asked questions about how they identify racially, and how their experiences may have affected these identities. Her research primarily focused on how Latinos identify in the “racial middle,” which encompasses the races other than black and white. According to Flores-González, the majority of the Latinos she interviewed had experienced racism or had been stereotyped as “illegal” immigrants, which makes them feel unwelcome. Flores-González said she believes this is the reason why many millennial Latinos feel as though they have to choose between an American or Latino identity. “We need to also pay attention to how the historical moments, coupled with the racial experiences are making Latinos and Latinas feel like they don’t really belong here,” Flores-González said. The U.S. Census Bureau estimates there are approximately 54 million Hispanics living in the country, which is roughly 17 percent of the population. According to Flores-González, Latinos who grew up in predominantly white neighborhoods or in middle-class families are prone to labeling themselves as white. She said she believes this is a result of assimilation and the individuals trying to feel more American. Flores-González was invited to speak at the University as part of her application for a senior social scientist and associate professor position at the Center for Mexican American Studies. Luis Guevara, program coordinator for the CMAS, said the atmosphere of the University was not as welcoming to the Latino population when he first arrived in 1991 as it is now. Eric Bybee, a cultural studies and education graduate student who is Latino, said although there is racialization of his ethnic group, he feels comfortable on UT’s campus. On Tuesday, the University announced that it was creating a new Mexican American and Latina/o Studies department in addition to the existing Center for Mexican American Studies. The move, which had been expected but previously delayed, is certainly important for personnel reasons, but it stands out more for the new level of recognition that it confers on an academic unit that struggled in the beginning just to get off the ground. For Américo Paredes, the opening of UT’s Center for Mexican American Studies was the realization of a lifelong dream. During his tenure at UT, Paredes fought tirelessly for and secured the creation of a special Mexican American studies program at the University. This was no small feat, as Paredes had to combat entrenched anti-Mexican sentiment both within the University and within the surrounding community. But in 1970, CMAS was formally established within what is today the College of Liberal Arts, where it has been housed ever since. Under Paredes’ direction, the center trained a new generation of folklorists, proud of their heritage and unafraid to challenge discrimination in all its rebarbative forms. Now that Mexican American studies has been given the go-ahead to departmentalize, what tangible changes will it see on campus? Most importantly, it will no longer have to rely solely on the borrowed faculty of CMAS. This lends a certain amount of independence by allowing the department’s faculty to evaluate one another for hiring, promotion and tenure. Additionally, department status comes with a unique budget, and that increased dollar amount gives clout to any academic unit. The addition of MALS to the campus will hopefully allow the work of early pioneers in the field to be continued and furthered. The Center for Mexican American Studies may become its own department if plans are approved in November and an advisory committee finds adequate funding sources. The center would become the Department of Mexican-American and Latino Studies. Domino Perez, associate professor and director of the center, said the major obstacle to implementing the center’s plan is finding funding. Perez said the departmentalization committee conducted its first meeting Friday to discuss funding efforts. The center could departmentalize by 2015 if its plan is approved in November. Perez said that the change would coincide with the center’s planned move to the Geography Building from its current home in Burdine Hall. The center moved into Burdine in July. The UT System Board of Regents approved a second expansion of the Geography Building and increased the total cost of the construction project to $15.5 million in August, making room for the center to move into the building upon its completion in March 2015. Perez said the regents have since cut the construction project by $1 million earlier this month. UT System spokeswoman Jenny LaCoste-Caputo said the regents, who have held two special meetings this month, have not taken any action on the building project since they approved its expansion in August. The center received a blow in June when Gov. Rick Perry vetoed part of a bill authored by state Rep. Jim Pitts, R-Waxahachie, that would have given $1.5 million to the center. The bill would have offset some large cuts to its budget from the 2011 legislative session. Perez said Perry’s veto has not trampled departmentalization efforts. The center is currently funded and taught by multiple departments. After its proposed departmentalization, the program would be part of the College of Liberal Arts. Richard Flores, College of Liberal Arts associate dean, said the college is working toward this end despite funding issues. The center received $138,578 through the College of Liberal Arts during the 2012-13 academic year, according to the University’s Budget Office’s website. “[Departmentalization] remains a priority of the college; the only question is how to fund it,” Flores said. Students and faculty voiced their opinions in favor of the Center for Mexican American Studies to become a department within the College of Liberal Arts at a forum Wednesday. The center offers undergraduate, graduate, masters and doctoral programs in Mexican American Studies funded and taught by multiple departments. If the center becomes part of the College of Liberal Arts, professors, lecturers and classes would be under one department. Center director Domino Perez said the center turned down the opportunity as recently as three years ago when the center was under a different director. 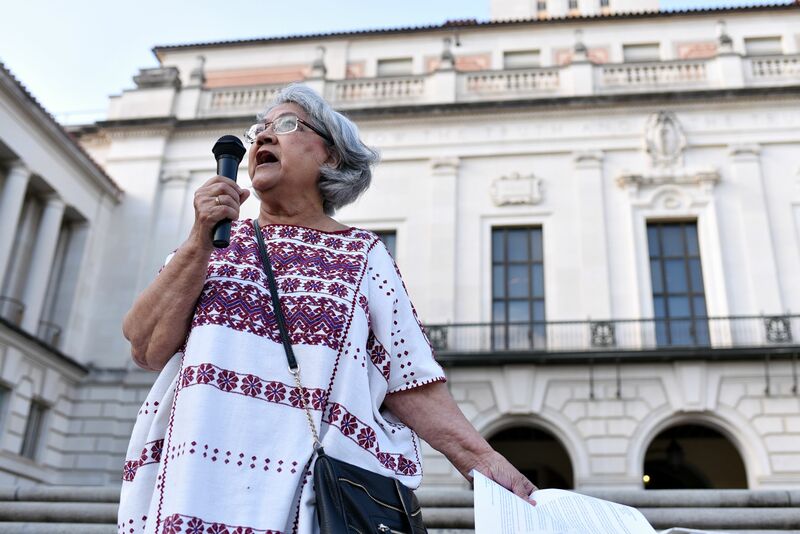 Perez said after UT President William Powers Jr. asked her in January to consider plans for the center’s future and departmentalization, she drafted a preliminary plan to departmentalize within the next 10 years, although it may not take that long to accomplish. She said the center tends to focus on yearly goals, including classes and community outreach, rather than a long-term mission for the center’s future. Perez said her proposal for the department includes a borderlands research institute that would focus on the Texas-Mexico border, although there are no specific plans yet. Randy Diehl, dean of the College of Liberal Arts, said he favors departmentalization if students and faculty want the center to move in that direction. This was the third forum hosted by the center this semester, intended to gauge what goals students and faculty want the center to have for the future. Before Wednesday’s talk, separate forums were held for students and faculty to discuss their thoughts on the center’s future, without the center or college administrators present to encourage an honest discussion. Associate journalism professor Maggie Rivas-Rodriguez said that during the faculty forum, departmentalization was not the topic of conversation, although it should have been. She said the center should ask for the faculty’s opinions before making the decision. She said the center will host a student and faculty planning session Jan. 11 to further discuss the option of departmentalizing.